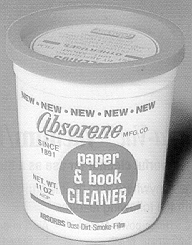 Absorene Book and Print Cleaner is a soft and pliable putty like material that looks and feels just like "play-dough". After taking a small handful of putty and working it in your hands until soft, you simply wipe it lightly in one direction across your document. The putty will absorb and lift dirt, dust and smoke right off the paper or most any surface. Packaged in 11 oz. containers.